CSC Services specialises in removing rust and old paint or coatings from surfaces without the problem of airborne dust particles, using the latest equipment. Vacuum blasting is a dust free process in which all materials, shot media and old coatings when blasted from a surface are vacuumed back into the machine via a hose attached to the inside of the blast nozzle. This process is used in areas which might house sensitive equipment, machinery or where dust might cause problems. This process is quite slow compared to conventional grit blasting but has its merits. There is very little mess and the operator does not usually need to wear PPE unless policy dictates. As a precision dustless blasting company CSC Services also use wet abrasive blasting or Quill, which is a combination of high pressure water jetting and standard dry grit blasting. This combination gives you power and efficiency without the problems associated with airborne/ breathable dust as the water prevents this. With the addition of water, this system uses approximately 50% less grit. 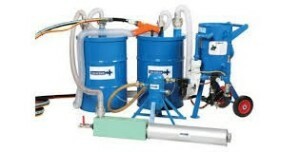 Vacuum blasting is a dust free process. All materials and old coatings when blasted from a surface are vacuumed back into the machine via a hose attached to the inside of the blast nozzle. This is of paramount importance given that dangerous levels of Silica (DUST) can be created when blasting materials such as concrete and masonry. Crystalline silica particles can cause lung disease and lung cancer. It only takes a very small amount of airborne silica dust to create a health hazard. The National Institute for Occupational Safety and Health (NIOSH) has a recommended exposure level (REL) of 0.05 mg/m3 to Silica. As the blasted material is immediately contained the process causes less mess. This means there is less need for areas to be screened off for work to commence which will usually reduce the length of time that the service is disrupted. 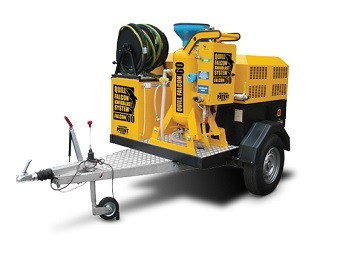 Workers using dustless blasting equipment do not need to be segregated from other workers. Precision dustless blasting is widely used by the NHS and in the food manufacturing industry where cleanliness is paramount. The process is environmentally friendly and efficient. Precision dustless blasting can be used in confined spaces and will provide a suitable mechanical key to which a new coating system can bond to. CSC Services offer repair services and a can advise on the optimum specialist coating to use. CSC Services have recently performed precision dustless blasting on a range of industrial units in the north east. This is usually to provide a key on internal walls for subsequent coating.